Are those amino acids you're sipping really doing anything for you? It depends on your goals. Here's the science, so you can decide for yourself! I frequently get asked whether or not you really need to supplement with BCAAs. Aside from the delicious taste, whether you need extra branched-chain amino acids comes down to two things: the type of exercise you do and your performance goals. Branched-chain amino acids (BCAAs) are made up of three essential amino acids: leucine, isoleucine, and valine. These amino acids are deemed "essential" because the body can't make them, so they must be consumed through food. Whey protein, for instance, is high in branched-chain amino acids. So are protein foods like chicken, beef, and eggs. But even though you get amino acids from your dietary protein intake, BCAA supplementation has its advantages. Pure BCAAs bypass the liver and gut and go directly into your bloodstream, meaning they can boost muscle growth more directly. Branched-chain amino acids are particularly important for people with muscle-growth or muscle-maintenance goals. BCAAs, especially leucine, help regulate protein metabolism by promoting muscle protein synthesis and suppressing protein breakdown. But, is that reason enough to take a BCAA supplement before training? The answer is a bit more complicated. Previous research has found that BCAA supplementation before your workout can help increase rates of protein synthesis, suppress muscle protein breakdown, reduce markers of muscle damage, and lessen the symptoms of delayed-onset muscle soreness (DOMS). [1-5] Sounds pretty impressive, right? Well, I hate to be a Debbie Downer, but these findings haven't necessarily proven that BCAA supplementation actually increases strength or muscle mass. If your goal is to add size and strength, and you're already getting plenty of amino acids through whole foods and protein shakes, additional BCAAs probably won't do much for you. Don't throw away your shaker bottle just yet, though! BCAAs may not stimulate hypertrophy on their own, but taking 6-10 grams of a BCAA supplement pre-workout can help maximize your protein synthesis potential. Since those extra amino acids promote faster recovery via protein synthesis, they can help you hit the weights with enough consistent intensity and volume to stimulate muscle growth and get you back in the gym sooner. Also, branched-chain amino acids are broken down during exercise and used as an immediate energy source. A decline in circulating BCAA levels leads to an increase in serotonin concentrations in the brain, which is thought to partly contribute to fatigue during exercise. This is especially true for endurance-based exercise. This makes BCAA supplements useful not just for the gym but also for running, team sports, and even hiking. 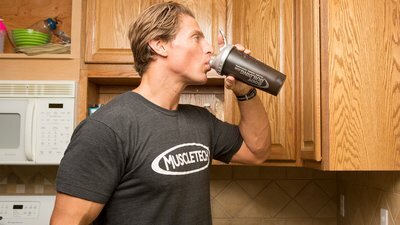 Keeping your amino acids topped off can help you get through longer workouts, and they make it easier to stay hydrated from start to finish, as well. Adding a scoop or two of BCAAs to your intra-workout drink can also be helpful if you follow a low-carb diet or train in a fasted state, because they may reduce fatigue and enhance fat utilization during exercise in a glycogen-depleted state. Since these amino acids don't have a lot of calories, they give you an energy and protein synthesis boost the way whey protein does, but without derailing your diet. And unlike pre-workouts, they're stimulant-free. Get a more in-depth look at how branched-chain amino acids work and how they help with muscle protein synthesis. Check this page out for an even geekier deep-dive into the science of BCAA supplementation. Mix up some fun amino acid mocktails to take your BCAAs to the next level. Newsholme, E. A., Acworth, I. N., & Blomstrand, E. (1987). Amino acids, brain neurotransmitters and a functional link between muscle and brain that is important in sustained exercise. Advances in Myochemistry, 1, 127-133. Gualano, A. B., Bozza, T., De Campos, P. L., Roschel, H., Costa, A. D. S., Marquezi, M. L., ... & Junior, A. H. L. (2011). Branched-chain amino acids supplementation enhances exercise capacity and lipid oxidation during endurance exercise after muscle glycogen depletion. The Journal of Sports Medicine and Physical Fitness, 51(1), 82-8.